BY ORDER OF THE PEAKY BLINDERS!!! 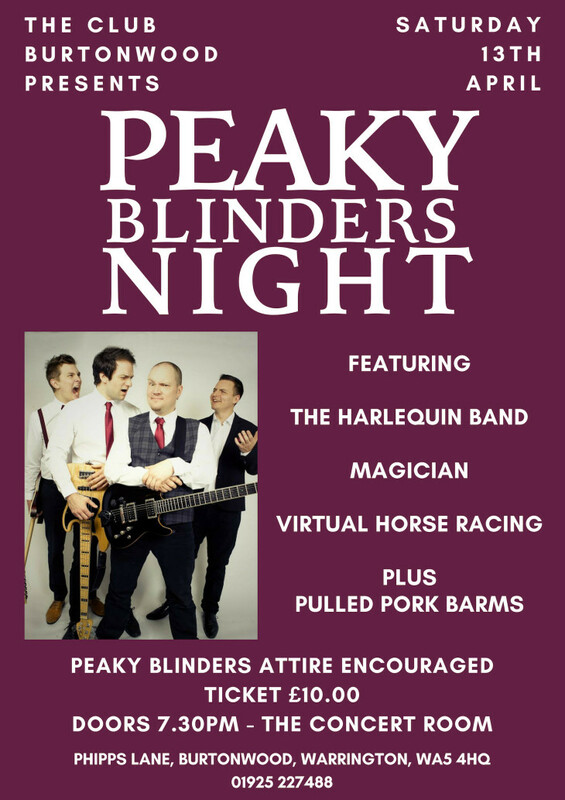 The Club Burtonwood Presents... PEAKY BLINDERS NIGHT - SATURDAY 13TH APRILl!!! We welcome back the fantastic Harlequin Band, plus this time we have the brilliant Brad Bennett Magician, Virtual Horse Racing and Pulled Pork Barms so make sure you join us for our second Peaky Blinders Night!!! Again we encourage everyone to dress in their best Peaky Blinder's attire. Tickets are £10.00 each and go on sale from the 1st February 2019.